There is no other fiction author I know of who handles her characters with the grace of Jhumpa Lahiri. Perhaps related, there is no author I know of who draws so little attention to herself as the writer within the text while maintaining such an established personal style. She is invisible, leaving no smudges, no winks, no flares of self-aggrandizement. Yet she is quietly overwhelming, like a wind you can’t see that knocks you back onto the grass. One of our greatest living writers of fiction, she uses the full word count of a book in the way many writers craft individual, stunning sentences. Her prose has been called plain, and in the sense that her sentences don’t draw attention to themselves, don’t dance and sing and make you reread them for their self-contained poetry, I suppose this is true. One must understand what that does not mean, however. Her sentences are lovely, streamlined things, sleek vessels that each deliver their passengers to the next until you arrive at the end of chapters breathless, never having taken the restful moment afforded by a sentence that asks you to immediately reread its beauty. The smooth contours of her prose undulate with a slow, sweeping rhythm, drawing us through years in the lives of her characters as easily as they usher us through brief moments in those lives. I rarely read a novelist whose leaps in time do not feel impatient, or convenient, or abrupt. Lahiri jumps decades because the contour of the convective air above those years breathes under the wings of her story, lifting it and setting it down where we need to look closer. 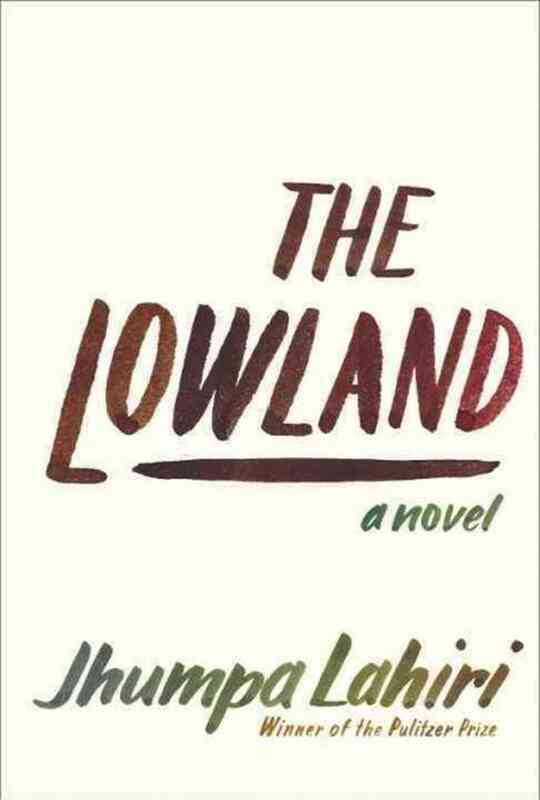 Though Lahiri’s first book, the short story collection Interpreter of Maladies, won the Pulitzer Prize for fiction (2000), her most recent effort, 2013’s The Lowland from Alfred A. Knopf, is perhaps her best yet. Each of her books–Interpreter, 2004 novel The Namesake, 2008 story collection Unaccustomed Earth, and Lowland–has been stunning in its own right, but in The Lowland she seems to stretch herself to a new height, providing her most expansive and yet intimate tome yet in painting a portrait of the generations of one Bengali family. Lahiri is Indian-American, and the majority of her fiction deals with the Indian-American immigrant experience. The Lowland begins in the 1950s in Calcutta (now Kolkata), India. Two brothers–Subhash, the elder by 15 months, and Udayan–live in relative comfort in a small enclave with their parents. They are not wealthy but are spared the crushing poverty suffered by many residents of the city. We follow them as they complete their schooling and contemplate college. Subhash is accepted to a university in Rhode Island, United States, and leaves his family to study marine chemistry there. Udayan enters university in Calcutta, but also becomes involved with the Naxalites, a communist revolutionary party gaining traction in the country and beginning to clash with government forces. The two siblings have been close since Udayan’s birth, but Subhash’s move and Udayan’s progressively more violent ideology begins to separate them. Surprising his brother and parents, Udayan gets married. Then an event takes place that will change the lives of everyone in the family, a boulder in the middle of their lives that the current of their years will wrap and swirl around forever. That event happens before the 100-page mark, and it’s really the last thing I can tell about the story before you read it. Jhumpa Lahiri is not a suspense writer. Her writing could not possibly bare less resemblance to that genre, and yet you do find yourself turning pages, waiting to find out where these characters’ lives go next. Lahiri wraps the reader up so intimately in the private lives of her players you do feel something that has to be called suspense, though the feeling carries none of the cheap escapism common under that descriptor. I first caught up with Lahiri’s writing after watching Mira Nair’s lovely 2007 film adaptation of The Namesake. Nair, herself Indian-American, is the perfect director to handle Lahiri’s fiction. The 2006 book exploring Nair’s film career was titled Mercy in Her Eyes, and that moniker is a wonderful way of describing both Nair’s career as a director and Lahiri’s as a fiction author. Lahiri is unflinchingly honest in presenting her characters, and yet always merciful. The gracefulness I described earlier in her presentation of her characters is true of her prose styling, her structuring, and most especially of the way she handles her characters without leaving any trace of herself, but it is also true in the spiritual sense. The idea of extending grace, of looking with mercy upon human failing, is intrinsic to her handling of characters. There is no author I am aware of whom this is more true. The two fiction writers who have inspired and influenced me more than any others are Marilynne Robinson and Jhumpa Lahiri. Robinson writes the best sentences, the best paragraphs, of any writer I know. Her prose is poetry; breathtaking poetry that makes you stop and reread lines for the isolated pleasure they bring. Lahiri, as I described earlier, is not that kind of writer. The beauty of her writing is earned across the years of her characters, earned with every minor truth, every sliver of glancing insight, every dull ache we feel with them, every devastation and every pardon. We fall into the rhythm of her writing and when we learn its surface patterns, we begin noticing the poetry she isn’t putting into words, just below the surface, meanings like faces beneath the ice of a lake. We pick up on things she is telling us by not telling us. Her last two books have born monikers relating to the surface of the earth, and there is indeed a geography to her prose that we come to learn like a new land, a land I hope she returns us to for years to come. If you live the Greenville, Ohio, area, you can find The Lowland, as well as Interpreter of Maladies, The Namesake, and Unaccustomed Earth in the Greenville Public Library’s Fiction Room under the call number Fic Lahiri. Ask a librarian if you need any help! Cover photo credit “Tram in Kolkata” by Sandipan Paul.